The saving grace to many players game is the electric trolley. Many older players have found years more golf thanks to the ability to electronically transport their clubs round by their sides. 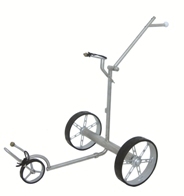 The electric cart is a strong, easily operated alternative to carrying your bag. The price of an electric trolley can be quite expensive, but in the long run it will be a good investment. Great idea for an older player or a lady player who struggles to carry or even push a bag round, the electric trolley can allow them to concentrate on their game and not their backs. Total weight incl. battery: only 10.5 kg! Pack size: only 64*32*17cm! Free shipping to other Europen countries, for a full-set order.